… which doesn’t appear to be a good deal at all, unless you love reading on your Kindle and/or are into instant gratification. While perhaps more “green” in many ways, $2.97 doesn’t seem like a great discount for the Kindle version of the (full) book. Before you make the same mistake I did, go back and "expand" your options of formats (click on where it says "Show 1 more format") because that is where you will find the correct Kindle edition of the collection of 14 short stories. This "format" is only for one story. I've contacted Amazon customer service so that they are aware of how misleading the listing is. Below and after the jump, an extremely detailed Kindle/Nook compare and contrast from a well-informed reader, in response to this previous comment by someone on the Nook team. This is presented in the public interest for those interested in the future of e-reading. More on the "all in one device" front later today. Too much, as least so early, is being made of the Motorola Droid's supposedly magical powers. Can a single handset "save" Motorola, launch a new operating system, and smite the evil Steve Jobs? It is tempting to compare the Droid to the previous magic handset, the Palm Pre, which was supposed to save Palm, launch s new operating system, and smite the evil Steve Jobs. The Palm Pre met none of those lofty expectations and has faded almost into insignificance. The Pre, however, lacks the Droid's Google-Motorola-Verizon pedigree. Which either gives it triple magic powers or three cooks to spoil the broth. Cisco Systems Inc (CSCO.O) and EMC Corp (EMC.N) are teaming up to sell a new line of networking gear, computers and storage equipment designed for use with cloud computing, according to sources familiar with their plans. The line of products, dubbed vBlock, position the two companies to better compete against IBM (IBM.N) and Hewlett-Packard Co (HPQ.N), which sell a broader array of data center equipment than either Cisco or EMC offer on their own. This must be a joke: A Novell corporate blog item that chastises the City of Los Angeles for recently selecting Google Apps to replace Novell's GroupWise e-mail and calendaring software. Alas, the PR blog post is very real. And while Novell may (and probably does) have a valid point, how many customers do you think would be happy to see their company mentioned like this on a vendor's Web site? “Unpublished is not a word we identify with a Kurt Vonnegut short story,” Sidney Offit notes in his foreword to “Look at the Birdie,” a new collection of Vonnegut’s early, and unpublished, short fiction. Perhaps more than any of his contemporaries of similar stature, Vonnegut was until early middle age a practical and adaptable writer, a guy who knew how to survive on his fiction. In the era of the “slicks” — weekly and monthly magazines that would pay decently for fiction — a writer had to have a feel for what would sell. The 14 stories in “Look at the Birdie,” none of them afraid to entertain, dabble in whodunnitry, science fiction and commanding fables of good versus evil. Why these stories went unpublished is hard to answer. They’re polished, they’re relentlessly fun to read, and every last one of them comes to a neat and satisfying end. For transmittal of moral instruction, they are incredibly efficient delivery devices. UPDATE: note that the Kindle edition has only one of the stories ("Look at the Birdie") -- a fact that is not clear in the screen clip above. So it's not such a great price... but it is still a fun read. Looks like Amazon has some work to do, in order to clarify distinctions between dead-tree and Kindle versions of books. See this post for more details and musings. The new, free Microsoft Security Essentials (microsoft.com/securityessentials) doesn't follow that pattern. This download for Windows XP, Vista and 7 seems downright meek: You don't have to click past upsells for a premium edition when you install it, and your only hint of its existence afterward may be two icons at the corners of the desktop. Combined with Windows' built-in firewall and the automatic blocking of hostile Web sites provided by such modern browsers as Firefox and Microsoft's Internet Explorer 8, Security Essentials can do a lot to keep a PC safe — and without the irritation factor of many competing programs. But it can't do it all. The most effective security measure — on Windows or in any other operating system — remains a cautious, skeptical person between the chair and the keyboard. It's five times larger than the Titanic, has seven neighborhoods, an ice rink, a golf course and a 750-seat outdoor amphitheater. The world's largest cruise ship is finally finished and Friday it began gliding toward its home port in Florida. The Oasis of the Seas will meet its first obstacle Saturday when exits the Baltic Sea and must squeeze under the Great Belt Bridge, which is just 1 foot taller than the ship - even after its telescopic smokestacks are lowered. Yet neither Obama's anticorporate leanings nor Google's anti-"politics as usual" culture has stopped the two camps from collaborating closely. Schmidt sits on Obama's Council of Science and Technology Advisers. Google employees acted as advisers to the Obama transition team -- in one case Google executive Sonal Shah actually led a meeting, to the surprise of at least one attendee -- and a handful of ex-Googlers have joined the administration in various roles. The most visible appointee is Google's former head of global public policy, Andrew McLaughlin, who was named deputy chief technology officer in June. McLaughlin's appointment raised eyebrows -- in his previous role McLaughlin championed Google's policy goals. Now he'll be in a position to shape policy that affects Google's rivals. White House spokesman Nick Shapiro says McLaughlin's appointment complies with the letter and spirit of the ethics standards Obama imposes on his administration. In other words, the wizards of Mountain View can't flick other companies off the map with their fingertips. What they can do is leap far enough ahead of competitors in a single product launch to shock them into attention. When those firms draw the appropriate "get better or get lost" conclusion and redouble their efforts, customers should benefit. This effect may break down when Google steps into markets dominated by firms selling devices instead of software. In the time it takes a manufacturer to usher an improved gadget from whiteboard to circuit board, Google can push out three or four rounds of updates to a Web application. You shouldn't feel obliged to avoid Google altogether because of this power to upend markets. But you should remind yourself not to discount worthy alternatives just because they're Not Google. There's also much to be said for keeping a part of your online identity -- maybe your photos, maybe your e-mail -- outside of Google. Spread your business around, and one company can't get too comfortable with it. "Bestselling" or by "Avg Customer Review"
2. Amazon's currently free Non-Classics - This one changes. a. The link above is to Non-Classics sorted by BESTSELLERS. b. Here are Non-Classics sorted by NEWEST books first. 3. "Big Deals on Kindle" - This one just doesn't change enough. 4. The Project Gutenberg e-books catalog (MOBI editions) for Kindles. You can search the catalog on your Kindle and click on one to have it downloaded to your Kindle from the site. There are no Amazon charges on a download from the Project Gutenberg site. Would you consider pre-ordering my book? That way I can get it into more bookshops. And we can spread the good news about the amazing ALL-GRAPHIC FUTURE OF CIVILISATION THAT AWAITS US! It’s out in the US 10th November. And in the UK on the 4th February. Councillors in a rural town have staged a mass walkout after becoming fed up with criticism from a blogger. Ex-vice chairman Anthony Canvin said 11 of Somerton Town Council's 15 members resigned at a meeting on Tuesday. The iPhone's awkward, delayed entry into China reflects the regulatory and technical hurdles of a fast-changing market where other global technology companies have struggled to establish themselves. Unicom's iPhones lack WiFi because it was temporarily banned by Beijing, which was promoting a rival Chinese system, according to BDA. The ban was relaxed in May after manufacturing had begun. The blame, he said, rested squarely on management. “A fish rots at the head first,” he declared. There was no better proof of that than the jumble of chips, operating systems and other software used on the company’s phones. Companies like Nokia build phones around a handful of standard designs, but Motorola was starting fresh on nearly every handset. Facebook said Thursday a California court has awarded the social networking Web site $711 million in damages in an anti-spam case against Internet marketer Sanford Wallace. Facebook sued Mr. Wallace for allegedly accessing users' accounts without their permission and sending phony posts and messages. The company said on its blog that in addition to the damage award, the San Jose, Calif., court referred Mr. Wallace to the U.S. Attorney's office for prosecution for criminal contempt of court—meaning he could face jail time. Apple is in a terrible position here because the future of mobile apps are Web apps, and Google excels at making those. Apple needs Google, it's most dangerous competitor in the mobile Web market, to keep building apps for the iPhone. Google would be foolish not to since the iPhone still has the largest reach of any modern Web phone. But it will no longer be a priority. The sad thing is that Apple has been here before?with Microsoft. In the late 1990s, Apple had to beg Microsoft to keep building Office for Macs. Now it may be in the same position with Google. There may be more than 85,000 apps in the App Store, but it is only a handful which actually drive purchases. If Google Maps Navigation becomes one of those types of killer apps, Apple might need to do some begging first before Google goes through effort to make it for the iPhone. Here’s a startling vision for the next decade: two familiar online phenomena converge in an emerging technological arena to strike a fatal blow to American civil society. The emerging technology, called “Augmented Reality,” enables users to see location-specific data superimposed over their surroundings. Long a staple of science fiction, it’s trickling into the real world through the iPhone and similar ultrasmart mobile phones. With AR applications such as Layar, the smart phone displays what its camera sees, with information about nearby buildings and shops, travel directions, even notes and “tags” left by other users in that location. Although AR now relies on handheld devices, electronics makers like Sony are working on systems that you wear like sunglasses, making augmented vision more immersive. The coverage of Microsoft’s Windows 7 operating system has been voluminous and consistent during the last few months, and now Microsoft itself is offering—for free—a kind of one-stop shopping site that sums up the new program. The 140-page “Windows 7 Product Guide” is available to download here. The file size in the PDF format is 62 megabytes. When I was a kid, my dad bought a copy of the Encyclopedia Britannica. It had 32 volumes and took up 4 feet in the book case. I loved to sit on the couch and flip through it, reading articles at random. Now, I'm returning the favor, giving my father an encyclopedia that has the equivalent of 1,000 volumes. Yet it fits in his pocket, and it costs just $99. There are few better illustrations of the staggering advance of digital technology than the new WikiReader. It's the size of a thick table coaster, and contains nearly the entire text of the English-language Wikipedia. That's 3.1 million articles, written and edited by volunteers around the globe. Looking back, Mr. Jha said that Motorola was in worse shape than he knew when he took the job, largely because of a dysfunctional management culture that missed the shift in consumer preferences from phones intended primarily for talking to those that do nearly everything a computer can do. The company’s engineering talent, which had once developed great phones, remained intact, he said. As luck would have it, one of those engineers, Rick Osterloh, grabbed Mr. Jha just as he stepped off the stage at that first town meeting in August 2008. Mr. Jha had mentioned Google’s Android operating system for smartphones. Mr. Osterloh rushed the stage to tell him he was working on an Android phone in Motorola’s Silicon Valley outpost that would bring together text messages, e-mail and social-network updates. People visiting Microsoft's new store in Scottsdale, Ariz., have started noticing something interesting, apart from its shameless similarities to Apple's retail outlets. The computers on display in the Microsoft Store come without any run-of-the-mill "crapware" -- the derisive term used for generic trial software and other unwanted programs that commonly clog new PCs when they're shipped by computer makers. Under a new initiative called "Microsoft Signature PCs," the company has removed those programs from the computers it's selling and loaded them instead with full versions of its own Windows Live software and services, plus programs such as Silverlight, the Zune software, and Adobe's widely used online technologies. It's an interesting move by Microsoft on multiple levels. Yet a SharePoint app is fundamentally an ASP.NET app, so the two worlds have a good deal in common. With the 2010 release, Microsoft has put a significant amount of effort into making SharePoint a better development platform for creating what might otherwise be straight ASP.NET applications. If you're interested in this area, I've written a Microsoft-sponsored white paper titled The SharePoint 2010 Developer Platform: An Introduction for ASP.NET Solution Architects. The paper's goal is to provide a big-picture view of SharePoint as a platform for creating applications. It's clear to me that with the advent of SharePoint 2010, a significant number of applications that might have been built using plain ASP.NET will instead be built on SharePoint. If you're interested in why, you might find the paper useful. GPS navigation devices were the latest must-have tech toys just two years ago, and shares of device makers like Garmin and TomTom were soaring. That didn’t last long. In a turnabout that has been remarkably swift even for the fast-moving technology business, those companies have suffered as competition has pulled down prices — and as more people have turned to their cellphones for directions. “The textbook is no longer the center of the educational universe,’’ said Wendy Colby, a senior vice president at Houghton, which is based in Boston. The Boston publisher is selling some textbooks to Detroit, but most of the contract is for such software such as Learning Village - a customized, interactive classroom network. Detroit’s teachers will be able to prepare and assign homework through Learning Village and use its tools to measure how well students learn - even how well they understand a lesson taught earlier in the day. Sunstein begins with the relatively uncontroversial premise that a vigorous exchange of information is critical to the democratic process. As he acknowledges, the Web makes virtually unlimited amounts of information available; it is now possible to sit in a coffee shop in New York and read not just the newspapers from Chicago, Boston, and Los Angeles but also those from Cairo, Beijing, and London, while simultaneously receiving e-mail alerts on the latest movie openings and corporate mergers. From this, it is often argued that the Internet is a boon to democracy—if information is good, then more information must be better. But, in Sunstein’s view, the Web has a feature that is even more salient: at the same time that it makes more news available, it also makes more news avoidable. Put the Web’s filtering tools together with cyberpolarization and what you get, by Sunstein’s account, are the perfect conditions for spreading misinformation. Who, on liberal blogs, is going to object to (or even recognize) a few misstatements about Sarah Palin? And who, on conservative blogs, is going to challenge mistaken assertions (or, if you prefer, lies) about President Obama? A major new release from Altova – check this page for the most-wanted feature summary and here for more detailed product updates. Instead of pushing some proprietary platform or other hidden agenda, we at Altova believe in delivering exactly those features that our users need the most. We’ve listened to your feedback via our discussion forums, support requests, and social networking sites and put together a list of the MOST WANTED features that will help you stay at the cutting edge of technology and deliver the best results that your clients demand. States often collect far more information about students than necessary and fail to take adequate steps to protect their privacy, a national study concludes. The dossiers go far beyond test scores, including Social Security numbers, poverty data, health information and disciplinary incidents. The study from the Fordham University Center on Law and Information Policy, released Wednesday, casts light on data systems created at the urging of the federal government to track student progress. One finding: States often fail to spell out protocols for purging records after students graduate. The founders of Electric Literature, a new quarterly literary magazine, seek nothing less than to revitalize the short story in the age of the short attention span. To do so, they allow readers to enjoy the magazine any way they like: on paper, Kindle, e-book, iPhone and, starting next month, as an audiobook. YouTube videos feature collaborations among their writers and visual artists and musicians. Starting next month, Rick Moody will tweet a story over three days. Marshall Kirkpatrick at ReadWriteWeb writes about Eric Schmidt's predictions about the future of the Internet, delivered at a Gartner conference. I'm rarely impressed by Mr Schmidt's predictions or analysis of Internet trends. Even though he is CEO of Google, his position seems to fail to provide him with anything insightful to say about the future Internet. If a user is reported as deceased, Facebook will remove sensitive information such as status updates and contacts. When reporting a death, users must offer "proof" by submitting either an obituary or news article. "When someone leaves us, they don't leave our memories or our social network," Max Kelly, head of security at the firm, wrote in the official Facebook blog. "To reflect that reality, we created the idea of "memorialised" profiles as a place where people can save and share their memories of those who've passed." Part of an ongoing initiative to make its products more open, Microsoft Corp. today announced at the Eclipse Summit Europe new solutions that help developers using the Eclipse platform take advantage of the new features in Windows 7 and Window Server 2008 R2, and reinforce Java and PHP interoperability with Windows Azure and Microsoft Silverlight. Microsoft worked with open source companies, Tasktop Technologies Inc. from Canada for Windows 7 and Window Server 2008 R2, and Soyatec from France for Windows Azure and Silverlight, to provide greater choice and opportunities for developers working in heterogeneous computing environments and use a mix of Microsoft and open source technologies. Eclipse Gets Interoperability and Next-Generation Experience on the Microsoft Platform: Microsoft teams with Tasktop Technologies and Soyatec on open source projects designed to foster interoperability and make Eclipse a first-class tool on the Microsoft platform. Along with last Friday’s upgrades to its News Feed and Live Feed features, Facebook also added a Reconnect tool, which takes the current Suggestions feature one step further and recommends friends a user should contact if they haven’t been in touch for a while. Which is when the blogosphere went haywire. Apparently, the Reconnect tool got a little cheeky and started suggesting reconnections with users’ exes, current spouses (”Um, wasn’t that what the weekend was for?” wrote Twitter user Davidwinfrey), as well as users’ deceased friends whose profiles remained intact. I started blogging with Blogger ten years ago today. This site only goes back to 2002, as I previously published to a free Yahoo! site (and switched when Yahoo! started charging for the service); the first ~3 years of the blog exist only as local archive pages at this point. I don’t know how many people read the blog on a regular basis, as I can’t currently track the number of readers who follow the RSS or Atom feeds. Checking the ClustrMaps widget from time to time, I’ve apparently had 200+ daily “visits” during most weekdays lately, and it’s nice to know some people continue to find the blog worthwhile. As concerns rage over the spread of the H1N1 flu, a federal report showed that a pandemic that would keep millions of Americans at home could also overload Internet networks. Adults working from home, children accessing video files and playing games online and families logging on for information about the illness would overwhelm residential Internet networks that were never built to have a majority of users on the Web at the same time, according to an October report by the Government Accountability Office, the investigative arm of Congress. Yahoo finally shuttered Geocities today. Acquired in 1999, Geocities was one of the costliest dot-com duds of of all time: $3.5 billion for an ugly, cash-bleeding homepage hosting service. And to think Google's founders were simultaneously begging server funds. Even though the wireless unit of Verizon Communications started an aggressive ad campaign for its new Droid handset that directly challenges the iPhone, Mr. Seidenberg, Verizon’s chief executive, said he would be delighted to sell Apple’s smartphone. Pilots of a Northwest Airlines jetliner that overshot its destination by 150 miles last week told U.S. investigators they became distracted during an extended discussion of crew scheduling that included their use of personal laptops, officials said on Monday. 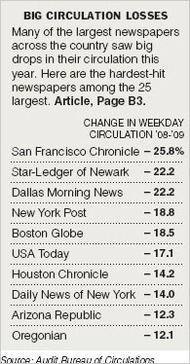 The two-decade erosion in newspaper circulation is looking more like an avalanche, with figures released Monday showing weekday sales down more than 10 percent since last year, depressed by rising Internet readership, price increases, the recession and papers intentionally shedding unprofitable circulation. Get ready for a closeup: your next job interview might be on webcam. Looking to save time and money, companies are turning to video-chat software as a cheap, low-hassle way to vet job candidates. That means a growing number of people looking for work are meeting their prospective new bosses not at the office but in the comfort of their own home. More than half of office staff spend 40 minutes a week on social networks such as Twitter and Facebook for personal use while at work, costing businesses an estimated £1.4bn ($2.3bn) a year in lost productivity, according to a survey. Out of 1,460 workers surveyed by Morse, an information technology services provider, 57 per cent said they used social networking sites during the working day for personal use. On average, those people spent 40 minutes on these sites each week, equating to just under a full working week being “wasted” each year, said the company. Gartner, the research group, sees Android eating into Nokia’s leading market share and featuring on 18 per cent of smartphones by 2012, up from 1.6 per cent in the first quarter of 2009. That would put it ahead of RIM on 13.9 per cent and Apple on 13.6 per cent. Android will inevitably beat the iPhone, according to Ken Dulaney, a Gartner analyst, if only because it will feature on many more handset models. Apple has only the iPhone and does not license its operating system or technology. Smartphones account for only 14 per cent of the market today, but more than 500m are expected to be sold in 2012 when they are forecast to account for up to half the market for mobile phones. In the next several weeks, Twitter users will discover two new features, Lists and Retweets, that had the same user-generated beginnings. Alliance@IBM, a union that represents a small number of IBM employees, posted an open letter on its website Tuesday asking the US Department of Justice and US Securities and Exchange Commission to launch a probe of all IBM executives. On behalf of current and former employees at Big Blue, the organization is an extremely vocal critic of IBM outsourcing and its downsizing of domestic operations. Tim Berners-Lee, the man who invented the World Wide Web, has joined Twitter. The move, TechCrunch glibly warns, "could potentially rip a hole in the time/space continuum." Berners-Lee is also the director of the Web's standards organization, so his first post Thursday evening, "Ooops confusing user interfxce. And no phones on on stage with radiomikes," could spark some "interfxce" rethinking at Twitter HQ. Less than 24 hours later, Berners-Lee already had more than 7,000 followers. The Mozilla Labs blog posted details of a new project described as, "an exploration in messaging innovations," which sounds an awful lot like Google (NSDQ:GOOG) Wave. Like Google Wave, the project, called Raindrop, is an effort to centralize the disparate sources and ways in which most of us receive digital information. Raindrop is an interface for information users receive from e-mail, notifications, conversations and from social networking sites like Twitter, Flickr and YouTube. To address the above pain points, we have created the Visio Process Repository, a new SharePoint site template that is available out of the box with SharePoint 2010. It leverages SharePoint’s collaboration features -- including check-in and check-out, versioning, and workflow -- and integrates with several of Visio’s new process management features. The result is that in just a few clicks, a SharePoint administrator can create a Visio Process Repository that is pre-configured for easy storage and management of Visio process diagrams. E-mail in particular and online writing in general have their well-known flaws and limitations, but they have also served as cleansing agents for prose, much as journalistic writing did early in the 20th century. That is, while they may disinhibit inappropriate declarations, they also inhibit dull, abstract wordiness. Maybe the best thing I can say about ­e-mail is that I can’t imagine anyone using it to compose such a sentence. Amazon, unsurprisingly, isn’t positioning the Windows-based Kindle app as a replacement for its Kindle device. Instead, as it does currently with the iPhone, it is positioning it as a complement to a Kindle reader. That said, users don’t have to have a Kindle to use the Windows Kindle app. All they need is an Amazon account. The Windows Kindle app is being optimized to run on Windows 7 and will support multi-touch and JumpLists. Users won’t be able to annotate their Kindle content on Windows PCs in this beta; they will be able to view their annotations made from iPhones and Kindle devices on the Windows version, however. There also is currently no text-to-speech functionality in the Windows version of the Kindle reader. Schmidt doesn't come across as Capitol Hill's biggest fan. Google is a tech company that loves facts, metrics and algorithms, after all. Schmidt might prefer a political system that dealt in such quantities. "I spend so much time in Washington now because of the work that I've been doing, I deal with all these people who make assertions without fact," he said. Policy people "will hand me some report that they wrote or they'll make some assertion, and I'll say, 'Well, is that true?' -- and they can't prove it." Perhaps that could change some day, he suggested. Technology could help. "The part of politics in Washington that's 'who you know' and all that kind of stuff, it's just not very interesting," he said. There's Tweetdeck for your Tweets, Seesmic for your Facebook stalking -- and now Waver for your Waves! Waver is simply an Adobe AIR application that hooks into your Google Wave account. From there, you can create new waves, or update existing ones. I sincerely hope that the European Union’s reluctance was a surprise to Sun — because if not, the company took quite a gamble on Oracle’s commitment to the acquisition. This is particularly true in light of Sun’s downturn, which provides an easy excuse to at least try to renegotiate the price. However, the inclusion in the agreement of a bar on required Oracle dispositions indicates Sun may have known that antitrust clearance was a problem at the time of the agreement. At this point though, the debate is academic — and hopefully for Sun, Oracle really, really wants to acquire the company. Still, Sun would not have had to throw itself on Oracle’s mercy had it negotiated a better deal for itself to begin with. This is a lesson other deal lawyers should remember. Still, Apple has rapidly gained market s hare in the segment from a standing start. In the second quarter, its smart-phone market share had risen to 13.3% against Nokia's 45%, compared to Apple's 3% market share just a year earlier when Nokia had 47%, according to recent figures from research firm Gartner Inc.
And Apple has been doing much better than Nokia in the U.S. market. Nokia's share of the U.S. smart-phone shipments in the first half of 2009 was 3%, compared to Apple's 22% in the first half of 2009, according to the research firm IDC. Nokia doesn't disclose licensing revenue, but Edward Snyder, an industry analyst at San Francisco-based Charter Equity Research, said it is likely to be so small that it is immaterial to the company's annual revenue. He added any licensing fees are unlikely to be a significant blow to Apple, which had $34 billion in cash at the end of its September quarter. In a sign the holiday period could be good to online retailers, Amazon.com Inc. posted a 69% increase in third-quarter profit and offered a rosy outlook for the current quarter. The results were driven by a 44% rise in sales of electronics and general merchandise, including TVs and office supplies, which now account for 43% of the retailer's sales. Amazon also reported a 17% spike in sales of media, which had dragged on earnings in the second quarter because of sluggish video-game sales. The Seattle-based online retailer said yesterday that it will release an application called “Kindle for PC’’ in November. It will let you buy, download, and read Kindle books on a Windows-based PC, regardless of whether you own a Kindle. If you also own a Kindle, you can see any notes or highlights made on the e-reader. Amazon will also keep track of where you are in a book, so you can stop reading on your PC and pick up at the same place on your Kindle. If you’re running Microsoft Corp.’s new Windows 7 operating system and have a touch screen on your computer, you can zoom in on book pages by pinching your fingers. In the future, Amazon said, you’ll be able to turn pages by swiping a finger across the screen. Nokia said the patents cover wireless data, speech coding, security and encryption and affect all Apple iPhone models shipped since the iPhone was introduced in 2007. "By refusing to agree appropriate terms for Nokia's intellectual property, Apple is attempting to get a free ride on the back of Nokia's innovation," Mr. Rahnasto said. Given this new type of information and its value to search, we are very excited to announce that we have reached an agreement with Twitter to include their updates in our search results. Americans look set to spend $1bn (£600m) on virtual goods in 2009, claims a report. The cash will be spent on add-ons for online games, digital gifts and other items that exist only as data. Total spend on such items is expected to be up by 100% over 2008 and to double again by the end of 2010, said the analysts behind the report. In related news, Facebook is updating its gift store so it offers a wider variety of virtual presents. On Wednesday, a spokesman for Ms Kroes said the commissioner had "expressed disappointment that Oracle had failed to produce, despite repeated requests, either hard evidence that there were no competition problems or, alternatively, proposals for a remedy to the competition problems identified by the Commission". Eben Moglen, founding director of the Software Freedom Law Center, said the comments were "bad news for Oracle". A new report from the Pew Internet & American Life Project claims that 19 percent, or nearly 1 in 5, Americans who use the Internet also use Twitter or some other social networking status update service to keep in touch and share information about themselves with others. The bigger news is that this figure is almost double what it was in a previous survey in December of 2008. The survey also found a correlation between the number of wireless devices a person owns and the likelihood that they also use a status update service like Twitter. Only 10 percent of users with one Internet-connected device claimed to use Twitter, while nearly 40 percent of those with four connected devices use status updates to communicate. In fact, there is essentially a 10 percent per device relationship, with two devices coming in at 19 percent, and three devices at 28 percent. The new chief executive of MySpace has told the Financial Times that the company is no longer interested in competing with Facebook, effectively conceding defeat in the race to become the largest online social network. Owen Van Natta, a former Facebook executive who replaced Chris DeWolfe as chief executive of MySpace six months ago, said the company instead aimed to become an online hub for music and entertainment. "Facebook is not our competition," he said. "We're very focused on a different space." Mr Van Natta wants to capitalise on MySpace's status as a leading online music destination and used a presentation at the Web 2.0 conference in San Francisco yesterday to unveil new features that enhance its music credentials. According to Comscore, the news for MySpace is not good. Unique visitors are down 15 percent year over year; page views in September in the United States dropped to 22 billion from 40 billion in the same month last year. In certain cities and demographics, it is hard to find anyone who regularly visits the site. In an interview on Tuesday, Mr. Van Natta laid out some of his plans to stem the decline. In the five months since he joined the company, he has hired a new executive team, started cleaning up the site’s clunky, ad-choked interface, and acquired the social music service iLike in an effort to expand MySpace’s reach beyond the confines of its own social network. These days, getting a PC for $1,200 is no big deal. Even two PCs for that price is pretty run of the mill. Starting on Thursday, though, Best Buy will offer for that price a "PC Home Makeover" that includes three PCs--a laptop, desktop and Netbook--as well as a monitor and router. Even in-home Geek Squad set-up is included. The package includes an HP Slimline desktop (model s5212y), an 18;.5-inch monitor, HP mini Netbook as well as a "media-savvy" laptop (model G60-535DX) along with a Netgear 802.11-G router and in-home setup of each of the components. I see a lot of interest in Gmail but not nearly as much interest in Google Docs--spreadsheet, word processor--and I'd put calendar in between. In the future, are those going to reach parity, or is Docs just going to be this bonus feature? Schmidt: The way it plays out tactically is almost every sale is e-mail, calendar, and instant messaging. It doesn't start with Google Docs. They're playing with it, but fundamentally it's about e-mail and calendar. That's a pretty good project for a year for a significant company. They have to do a trial, convert the existing system, train users and support people. When you talk to those customers, they will tell you they will use Google Docs in conjunction with the e-mail accounts that they're already putting in place. That's how it plays out. It's first an e-mail sale, but once you have that, then you get the benefit of Google Docs. The nontechnical press describe it as Microsoft Office versus Google Docs. They're not comparable. The service will give users a more efficient way to find, learn about and sample music after they search for information about bands, albums or songs, said a person who has seen an early demonstration. Google, based in Mountain View, Calif., will not host any music, nor has it forged any new relationships with the major music labels. But it has struck deals with several streaming music services to let people easily sample music directly from the search engine. Some of technology's best-known companies are betting there's pent-up demand for on-demand books. Hewlett-Packard Co., the world's top seller of personal computers and printers, is teaming up with online retailer Amazon.com Inc. to challenge Internet search leader Google Inc. in the quirky new market of re-creating digital books as paperbacks. Ironically, Google created most of the digital copies in the University of Michigan's collection. A China copyright group Wednesday accused Internet giant Google of scanning Chinese books for its online library without authorisation, in the latest criticism hurled at the controversial project. The China Written Works Copyright Society told AFP its data showed at least 17,922 books had been scanned and included in Google Books, the Internet giant's project to digitise millions of books and post them online. ZL Technologies, a San Jose-based IT company specializing in ... enterprise software solutions for e-mail and file archiving, is challenging Gartner Group and the legitimacy of Gartner’s “Magic Quadrant.” In a complaint ... ZL claims that Gartner’s use of their proprietary “Magic Quadrant” is misleading and favors large vendors with large sales and marketing budgets over smaller innovators such as ZL that have developed higher performing products. But amid the gloom, some sellers and owners of electronic reading devices are making the case that people are reading more because of e-books. Amazon for example, says that people with Kindles now buy 3.1 times as many books as they did before owning the device. That factor is up from 2.7 in December 2008. So a reader who had previously bought eight books from Amazon would now purchase, on average, 24.8 books, a rise from 21.6 books. “You are going to see very significant industry growth rates as a result of the convenience of this kind of reading,” said Jeffrey P. Bezos, chief executive of Amazon. In a letter Tuesday to European Commissioner for Competition Neelie Kroes, Stallman -- together with nonprofit organizations Knowledge Ecology International and Open Rights Group -- urged Europe's top antitrust regulator to demand the divestment of MySQL in return for regulatory approval of Oracle's planned purchase of Sun Microsystems. When two Visalia, Calif., police officers swung their cruisers behind a sport utility vehicle that had been carjacked at gunpoint early Sunday, they prepared for a dangerous high-speed chase. The 2009 Chevrolet Tahoe roared away with officers in pursuit, but shortly after the suspect made a right turn, operators at General Motors Co.'s OnStar service sent a command that electronically disabled the gas pedal and the SUV gradually came to a halt. It was the first time since OnStar began offering the service in the 2009 model year that it was used to end a chase that could otherwise have had dire consequences. As we announced earlier today, Microsoft Sync Framework V2.0 is now available for public download. Along with this release I wanted to outline a number of companies and partners that are already using Sync Framework v2.0 including Windows 7, Microsoft Office 2010 and PricewaterhouseCoopers (PwC). SharePoint has also chosen to integrate Microsoft Sync Framework as part of their solution for synchronizing to Office SharePoint 2010. The SharePoint and Office teams will use the Sync Framework as the engine powering synchronization between Office Workspace (Groove) and SharePoint. In addition, the SharePoint server will also expose Sync Framework API’s that will allow any developer to build providers to integrate new data stores into SharePoint. As Steve Ballmer announced this morning at the SharePoint Conference, and Jeff Teper notes below in his post, the public beta of SharePoint 2010 and Office 2010 will be available in November. The SharePoint 2010 Developer Center is now live on MSDN. This new sub-site includes Getting Started modules, as well as a Beta version of the SharePoint 2010 SDK. To read more, take a look at the SharePoint developer documentation team blog, or head straight to the SharePoint 2010 Developer Center to see detailed, public technical information and instruction around both SharePoint Foundation and SharePoint Server 2010. President Obama this week issued a short video address discussing the importance of cyber security awareness. The three-minute clip offers little in the way of startling revelation or news. But it is probably the most the president has had to say publicly about the topic since May, when he delivered a 16-minute speech saying he planned to create a new cyber security office at the White House that would be led by an as-yet-unappointed coordinator. The popular view is that technology is the handmaiden of science — less pure, more commercial. But in “The Nature of Technology: What It Is and How It Evolves,” W. Brian Arthur, an economist, reframes the relationship between science and technology as part of an effort to come up with a comprehensive theory of innovation. In Dr. Arthur’s view, the relationship between science and technology is more symbiotic than is generally conceded. Science and technology move forward together in a kind of co-evolution. And science does not lead. According to technology website Wired.com, YouTube will place adverts around the video, although the form of the commercials has yet to be decided. The site will also offer viewers the ability to chat to one another using Twitter, or to donate to Bono's RED charity via a "donate now" button. However, it is not the first time that U2 have dabbled in live streaming - they allowed fans to watch a Boston date of their Popmart tour in 1997 via Microsoft's MSN website. The Sunday, October 25 show will take place at the Rose Bowl in Pasadena. Any fan wishing to tune in from the 16 countries supported will be able to do so for free. This is YouTube's second effort at live-streaming concerts. In August, it aired portions of the Outside Lands music festival in San Francisco. The U2 show will be the first start-to-finish live stream. Apple, in its recent history, has overcome nearly every obstacle thrown its way. Now it has surpassed another: the burden of high expectations. Apple managed to surprise optimistic investors, posting a 47 percent increase in profit in the fourth quarter and handily beating Wall Street’s estimates. Renewed sales of Macintosh laptops and the continued popularity of the iPhone around the world helped to lift Apple’s bottom line. Another interesting development in the digital book domain. I suspect we’re about to reach an interesting turning point, at which book-focused services will compete as much on their innovative use of hypertext as on their scope of book content coverage – i.e., in making the reading experience more productive (through the use of, e.g., reader annotations and concept linking) as well as more convenient and cost-effective. But it seems the Internet Archive is thinking even bigger than Google. Kahle said that he's been thinking about such a project since before the advent of the World Wide Web, but that the technology has never been ready. But that's changed over the last 20 years, he said. "We've now gotten universal access to free (content)," Kahle added. "Now it's time to get universal access to all knowledge, and not all of this will be free." He explained that BookServer is built on the notion of a Web server, and that only a good indexing system is standing in the way of making all books digitally and easily available to consumers, whether they're using a laptop computer, an iPhone, or a Kindle. Microsoft Research this morning is releasing a new book that aims to draw attention to the potential of bringing together large amounts of data from different repositories to help scientists make discoveries. The book, "The Fourth Paradigm," is available for free download. Keep in mind, while reading the analyst reports: they cover SharePoint 2007, and do not address the new features just announced for SharePoint 2010. This is my third and final post as part of our disclosure of SharePoint 2010 today. The previous posts covered the SharePoint History and how we Engineer SharePoint. This morning, Steve Ballmer and I are kicking off the SharePoint Conference so it is time to talk about SharePoint 2010! It is incredibly fun and rewarding to unveil this release driven input from you and innovative ideas from the team. As Steve announced, we will release the Beta of Office 2010 and SharePoint 2010 in November and look forward to your feedback as we finalization the product and documentation for release in the first half of next year. I've said it before, when Sprint and Palm did this with the Pre -- if the only way you can market your product is to compare it to some other product, you've already lost. Symantec found 250 varieties of scam security software with legitimate sounding names like Antivirus 2010 and SpywareGuard 2008, and about 43 million attempted downloads in one year but did not know how many of the attempted downloads succeeded, said Weafer. "In terms of the number of people who potentially have this in their machines, it's tens of millions," Weafer said. It was also impossible to tell how much cyberthieves made off with but "affiliates" acting as middlemen to convince people to download the software were believed to earn between 1 cent per download and 55 cents. Momentum, of course, is relative. Google claims that two million businesses are using Google apps, but it won’t disclose the size of those businesses, or how many are using only Gmail rather than the full suite of Google enterprise apps. What’s more, the vast majority of those businesses are using Google’s free apps. The company said that only a few hundred thousand users — that is, a few hundred thousand individuals, not businesses — are using paid apps. By comparison, Microsoft has some 500 million paying customers for Office. Just how much information will be stored in these windowless cybertemples? A clue comes from a recent report prepared by the MITRE Corporation, a Pentagon think tank. "As the sensors associated with the various surveillance missions improve," says the report, referring to a variety of technical collection methods, "the data volumes are increasing with a projection that sensor data volume could potentially increase to the level of Yottabytes (1024 Bytes) by 2015." Roughly equal to about a septillion (1,000,000,000,000,000,000,000,000) pages of text, numbers beyond Yottabytes haven't yet been named. Once vacuumed up and stored in these near-infinite "libraries," the data are then analyzed by powerful infoweapons, supercomputers running complex algorithmic programs, to determine who among us may be—or may one day become—a terrorist. In the NSA's world of automated surveillance on steroids, every bit has a history and every keystroke tells a story. The company Michael Dell started in his college dorm and built into the preeminent personal computer maker has fallen on hard times. As the center of the tech industry has shifted from the PC to the Internet, Dell has struggled mightily to find its place. While Hewlett-Packard (HPQ), IBM (IBM), and other rivals transformed themselves in recent years by acquiring new companies and capabilities, Dell long stuck with its old playbook of cranking out PCs as efficiently as possible. It's hard to remember that in 2005 Dell was valued at $100 billion, or more than HP and Apple (AAPL) combined. Today, it's worth $30 billion, less than a third of its rivals' market values.